San Diego County is home to a large, diverse and vibrant Asian community, making up some 10 percent of the entire county population. Chinese, Japanese, Filipino, Vietnamese, Korean, Cambodian - in fact, the county is home to one of the largest Filipino populations in the United States. 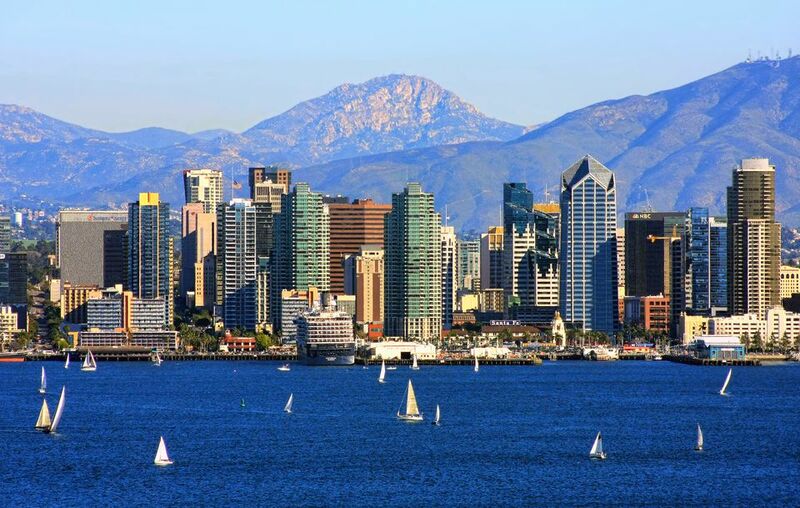 And although we might not have a Chinatown like San Francisco or New York, San Diego does have concentrations where the local Asian community - as well as the general population - goes to eat and shop for their favorite foods. Like dining in neighborhood hot spots like North Park or Hillcrest, seeking out Asian foods is a similar proposition, with many being concentrated in certain areas of San Diego County. Here are areas in San Diego where you can enjoy and discover some authentic Asian cuisine and food. The City Heights area of San Diego is probably the city's most ethnically diverse neighborhood. In this sprawling area between North Park and the College Area, you'll find a melting pot of Hispanic, Vietnamese, Somali, Indian, and Middle Eastern cultures. A bit rough around the edges and on the lower end of the economic spectrum but starting to see a rejuvenation, City Heights is where immigrants try to carve out their niche in the American Dream. Which is why this is place you want to go if you're looking for authentic ethnic food. One area worth exploring is a stretch of El Cajon Blvd. between Fairmount Ave. and 54th Street - an area recently christened as "Little Saigon." Here you'll find a concentration of Vietnamese restaurants, markets and businesses - many with signage in Vietnamese. If you're seeking pho, the delicious beef broth soup that has become popular in San Diego, this is where you want to go. Pho Hoa, at Euclid and El Cajon, is the grandaddy of pho shops. But there are a host of others: Pho King, Pho Ca Dao, Saigon Restaurant. If Vietnamese food is what you're craving, this is area to explore. In addition, there's a concentration of Vietnamese restaurants and markets at the corner of 54th Street and University Ave. It's also an area where you'll find authentic Asian markets: Hing Long Supermarket, and Vien Dong IV Market. Kearny Mesa is more of a business district rather than a neighborhood. One doesn't live in Kearny Mesa - you go to work or you shop there because this area bounded roughly by the 805, 52 and 163 freeways is populated by both small and corporate businesses. You go to Kearny Mesa to buy a car, or home improvement supplies. So, why is there such a high concentration of Asian food markets and restaurants in this largely unattractive area of the city? Who knows? But if you're looking for Asian delicacies, you head to Kearny Mesa, and especially along the Convoy Street corridor. Drive along Convoy and you will notice, amid the car dealerships and fast food establishments, a sea of strip malls. But then you notice the plethora of Asian food places - Korean, Japanese, Chinese, Vietnamese, Thai - you name it. Have a hankering for boba milk teas, noodles, seafood, pho, barbecue, and even karaoke? You have a huge number of choices here: Jasmine Seafood, Dumpling Inn, Chopstix, Tofu House, Spicy City, Manna Korean, Jeong Won. Too many to mention here. You just need to explore and discover. And if you're looking for food items specific to Asian cuisine that you can't find in your local Vons or Albertson's, then this is the are you want to come to. A number of well-appointed markets that cater to different cultures are located here including 99 Ranch Market, Zion Market, Mitsuwa Marketplace, and Nijiya Market are extremely popular. It can be construed as dubious when the biggest attraction a city touts is its proliferation of auto dealerships. As it were, National City likes to brag that its claim to fame is that it is the home to the "Mile of Cars," a stretch along the city's National City Avenue where over 20 dealerships call home. But National City is more than cars - it's an ethnically diverse city in San Diego's South Bay, home to a large Filipino community (probably because of the close proximity to the nearby 32nd Street Naval Base). And if you do make your way to National City, make sure you travel along the Plaza Blvd. corridor, where you will find a number of Filipino and Asian restaurants and markets. On the stretch of Plaza Blvd. off of the 805, you can shop for Asian groceries from Manila Seafood, or grab a bite from Filipino eateries like Conching's Cafe, Tita's Kitchenette, Manila Sunset, or Karihan Filipino Food. If it's Filipino food you're craving, you can't beat the variety found along Plaza Blvd. in National City. Mira Mesa is one of San Diego's typically sprawling suburban neighborhoods bounded by the 805 and 15 freeways and the Miramar Air Base. It is also home to a large population of Filipino residents (hence the moniker Manila Mesa) - perhaps because of the proximity, like National City, to the military base (do we see a pattern here?). but the presence of Filipinos and other ethnic groups have added to the diverse dining and shopping available in Mira Mesa. Manila Fast Food and Desserts or Seafood City will satisfy your Filipino food hankering. If you want something more with a kick, Spices Thai and Amarin Thai will serve you well. And if you want to try some Filipino style spaghetti and hot dogs (really), make a run to Filipino fast food chain Jollibee.